A man lays flowers at the French Embassy in Moscow commemorating victims of the 2016 terror attack in the French resort city of Nice. On 14 July 2016, a truck ploughed into a crowd of people celebrating Bastille Day on the Promenade des Anglais. 84 people were killed in the attack. Russian President Vladimir Putin has expressed his condolences to the French people following the July 14 terrorist attack in Nice, while Russians have united in their condemnation of the act on social networks. France is reeling after the latest in series of terrorist attacks in 2016 saw at least 84 people killed and hundreds injured by a man who drove a 25-ton truck through crowds celebrating Bastille Day on the Promenade des Anglais in Nice on the evening of July 14. The driver has been identified as Mohamed Lahouaiej Bouhlel, a 31-year-old French Tunisian, local newspaper Nice Matin said on July 15, reports the TASS news agency. Armed with a gun, Bouhlel plowed for over a mile through throngs of spectators watching a fireworks display over the seafront in the Mediterranean resort. According to the latest information, 18 people are in critical condition in hospital. One Russian woman has died and one is being treated. Earlier reports said Bouhlel was known to police due to some petty crimes, but was not previously linked to any radical groups. 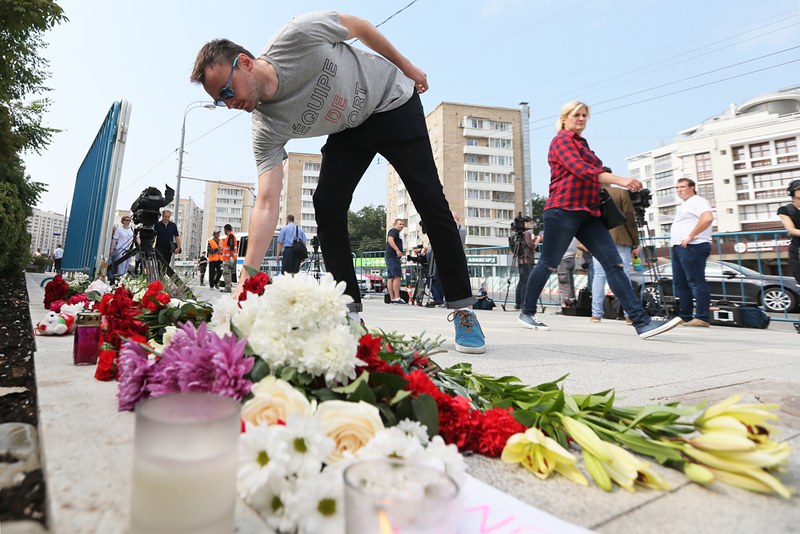 Russian politicians and society have united in condemning the terrorist act. "Russia expresses its solidarity with the French people in these difficult days,” said Russian presidential press secretary Dmitry Peskov on the morning of July 15. “It shares the pain related to the deaths of many people, including children. Russia condemns terrorism in the most decisive manner, knowing very well what this is and Russia intends to continue doing everything possible to fight terrorism," he said. "The mass murder in Nice is a horror movie that has become a reality. I offer condolences to the families of the victims and words of support to those that are suffering – especially the ones who are now on the verge of life and death. According to the latest data, 18 people are now in critical condition. And again, I repeat: let us fight not with "hybrid threats," but with real ones. And let's do this together, because we are all so much alike when we die as a result of the actions of terrorists and extremists. It's time for us to smooth out our differences before rather than after such tragedies." "Europe and Asia should unite against terrorism. Terrorists and their sponsors understand only force, and we should use it." Russians began coming to the French Embassy in Moscow during the night to lay flowers and pay their respects to the deceased. "One girl has come to the French Embassy. She says that next week she is flying to Nice." Я думаю о том, что виновата я, чего я не делала, что нужно было делать, чтобы этого не произошло. Теракт в Ницце - это очень близко. "I think about my own guilt – that I didn't do what I needed to do to avoid this. The attack in Nice - it's very close to me." "A terrible tragedy in Nice... My condolences to the French people and families of the victims..."
"Time after time their target is the most joyful country in the world because they [terrorists – RBTH] hate it when people are just happy about being alive," wrote one blogger. Twitter users have condemned the terrorist attack in unison and are calling on society to unite in the face of the terrorist threat. "It is better to hold hands than to hold a gun." "What world I am living in? In a world full of hate, blood and terrorist attacks… World, please let people be people and not animals."